A gluten free alternative to a comforting bowl of porridge! This millet porridge is everything a hot cereal should be: warm, comforting. and infinitely adaptable! My eldest had been recently reading a version of Goldilocks and Three Bears when she noticed me eating a new concoction. Let me give you a bit of history here: I love hot cereal in the morning: it’s a comfort food for me. My favorite has always been Cream of Wheat and I have many memories of being sick and only wanting a bowl of that stuff. Maybe it was just my mom’s special touch?! So when my daughter asked me if I was eating porridge, my mommy brain started rapid firing and I quickly decided to play along with this idea. “Why yes, it IS porridge!” I exclaimed. “Oh Mommy, can I please have some of your porridge?” she begged me. Inside I am jumping for joy that this healthy morning cereal might find it’s way into my child’s awaiting belly. I waited with baited breath to see the verdict: She wanted the rest of porridge!! Score!! Only problem was, I was enjoying it too much myself to be so selfless, so I gave her a bit more and promised a trip to the store to stock up on ‘porridge’ that afternoon. For those of you with little ones, millet is a GREAT grain to feed to them in cereal form. Many nutrition experts agree that waiting as long as possible to introduce highly allergenic foods (like gluten found in many baby cereals) to little ones, is ideal My little guy LOVES this cereal, and for him I just make the millet meal and cook it with water. I add in fruits and vegetables after the fact. I have also done this with teff. I wish I had thought of giving this grain to my two oldest when they were babies. Nutritionally, millet and teff are far superior to the traditional rice cereals. Want Some Protein Addition Ideas? 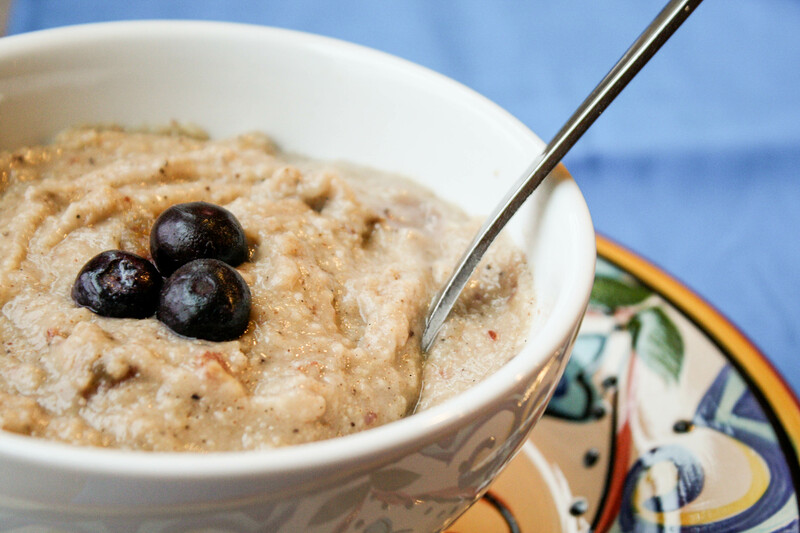 If you would like to add some more protein to this delicious porridge, there are many options! Collagen – tasteless, gut healing, and SUPER good for your body, I add this wherever I can!! I particularly like this brand as they test to make sure all their product are very clean….I don’t want any glyphosate in my collagen!! Use code “tessa10” for 10% absolutely any order! I get a small commission if you purchase though my links! Egg – one egg can be whisked into the cool milk before heating, makes it mice and rich too! More gluten free hot cereals? 2 Medjool dates chopped fine (any sweet dried fruit would work! In a large pan, toast the whole millet grain (in most bulk food sections) over medium heat, shimming the pan frequently to disperse the grains and not burn them. When they smell toasty and start popping, it's done. Maybe 5-10 minutes, depending on the quantity you are doing at one interval: I did a whole pound at once in my cast iron skillet. Grind grains in a clean coffee mill/spice grinder until powdery like flour: ready to use! Alternately, you could use a blender. You could also skip the toasting step, but the toasted flavor of the grain IS delicious and adds another flavor dimension to this simple cereal! 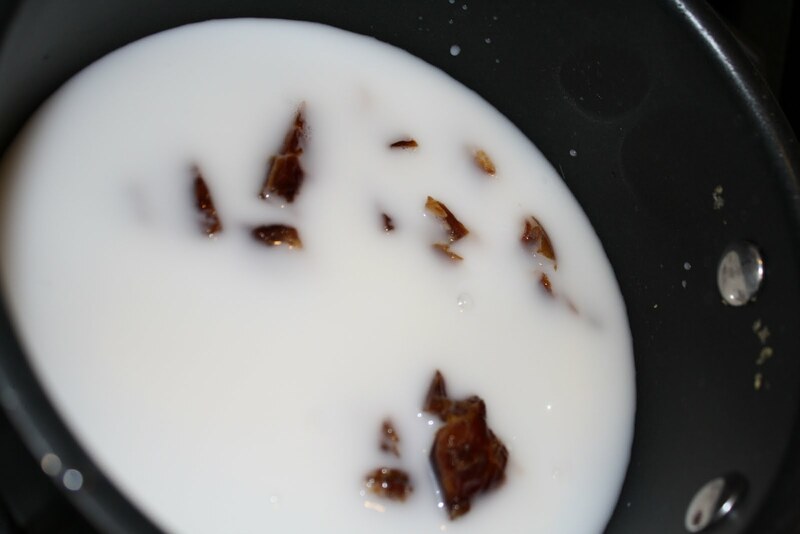 Let the mixture simmer for at least 5 minutes: this helps the dates disintegrate and gives the cereal sweetness. Add more milk or water for desired consistency. Add in vanilla if you choose! your recipes does not say how much water under ingredients but the method has water. please explain or correct. Fixed!! You have an option of using different liquids instead of milk. Thanks for finding that! As I was growing up, millet porridge was my favorite. My mom would also add some shredded pumpkin in it in the fall. I cook it on a regular basis. I just soak it overnight with a little bit of filtered water and sea salt. In the morning I rinse it and cook in a mix of water and flax or rice milk. It’s that simple. The soaking helps to achieve creamy texture. 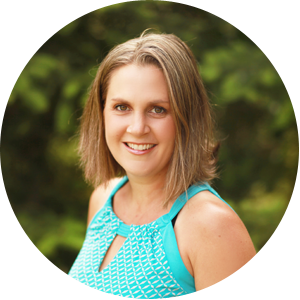 Found you through Monday Mania – thanks for posting – I really am enjoying your recipes! I want some! I just wish my daughter enjoyed hot cereals. I’ve tried oatmeal, buckwheat groats, sorghum grains – every one makes her gag, literally. But that doesn’t mean I can’t enjoy this, right? Hi Tessa, I’ve been making your Creamy Pumpkin Breakfast Cereal almost daily since I saw the recipe. I like that one so much that I’m hesitant to try this one! Which one do you like the best? We had a contractor in our house for several days and he noticed I was making the Creamy Pumpkin Breakfast Cereal every day. He asked me for the recipe, which I was happy to share. I even gave him some of my millet meal. He said he was planning on making a special breakfast for his family on the weekend and thought it would be nice. But karen, variety is the spice of life!! I adore that breakfast cereal too, and this is excellent in a different way! I haven’t posted it yet, but one of my favorite ways to make it like my mom used to (Cream of Wheat that is): she would whisk a egg yolk into the cold milk, and then whip the egg white into meringue with a bit of sweetener. You then fold the meringue into the cooked cereal…delicious fluffy goodness! I am so happy you love the OTHER cereal, I just love that one too! 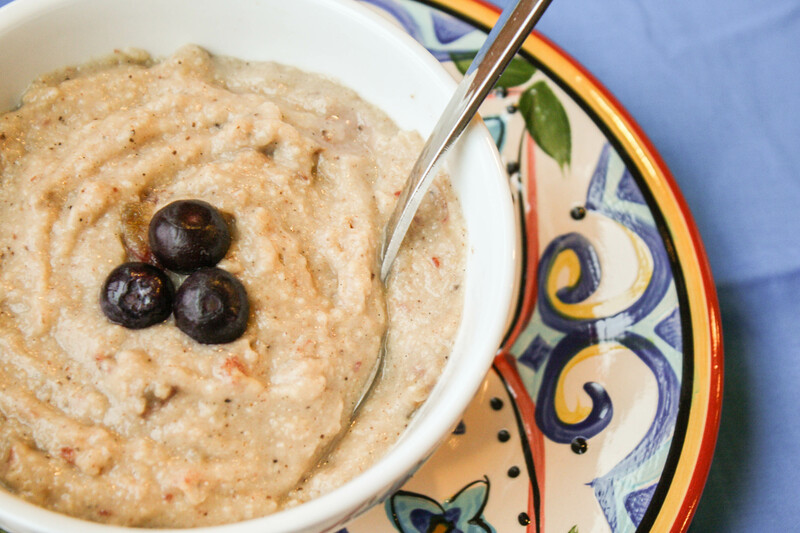 Thank you for sharing your millet porridge recipe with us at Beyond The Peel. You're recipes for the WWC are great and truly show how versatile millet can be! Oh my Jenna…there are so many things to do with millet!! I have a millet cornbread on here that is great. Via that blog post, you will see a link for a recipe round up I just particpated in on millet specifically @Beyond the Peel, some great millet recipes there. I would suggest you use a waffle or any baked good recipe you already like and replace some of the flour with freshly ground millet. It adds a nice flavor and lots of nutrition. May I ask how the millet was used in the waffles? I have used whole millet in some pan-fried patties, I have used it in tabbouleah-style summer salads. I think mixing it in with a rice or other familiar grain for a fried rice would be good to. Hopefully this helps! I bought a 5lb. bag of millet because I wanted to make a waffle recipe I had found. They were terrible :(! Now, I have LOTS of millet and no ideas. Could you tell me how to cook the millet whole? You'll have to let me know if there is a difference in texture/taste! How did you find out your girls were allergic? Found your blog through a post on facebook……I've been making millet porridge for a couple of months, but I like to soak the grain for 7 hours first, then dry in a 300 oven for 15-20 – grind and enjoy! I just found out my 3 little girls are all allergic to wheat/gluten, so they had their first millet porridge…..with a little almond butter, maple syrup, peach jam, almond milk – they loved it 🙂 I look forward to reading more of your blog! Welcome! Hope you enjoy it! Hi Tessa! I'm so glad I discovered your blog. There's so much deliciousness going on here! This recipe sounds like a wonderful departure from the ordinary, and I can't wait to try it! Thanks so much for posting it.